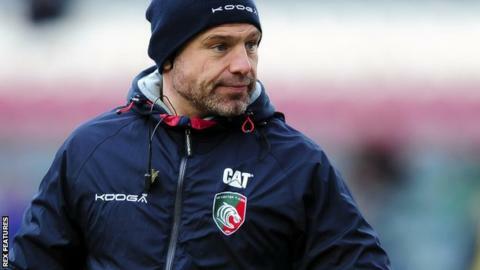 Boss Richard Cockerill insists Leicester Tigers can reach the Premiership play-offs for a 12th straight season despite dropping out of the top four with four games remaining. Sunday's defeat by Sale Sharks left Leicester fifth in the table, one point adrift of Northampton in fourth. The Tigers face Northampton with three games of the regular season to go. "We are determined to be in the top four, we want to be there and I think we will be," said Cockerill. "We've got to keep battling - twists and turns will happen." Leicester last missed out on play-off rugby in the 2003-04 season, finishing fifth. A year later they topped the table and went on an astonishing run of reaching nine successive Premiership finals, winning four. The Tigers have recorded more wins than Saints immediately above them in the table, but despite setting out this season to play a more expansive style of rugby, Leicester have claimed fewer try-scoring and losing bonus points than any side in the top six. "This will go down to the last game I think," Cockerill told BBC Radio Leicester. "It will be a tight old finish, I'm sure."